All transactions are safe and secure with a reliable history in online purchasing behind each of our associates. 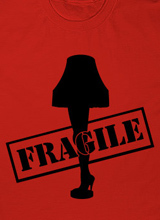 Buy the FRAGILE Leg Lamp t-shirt to own Christmas Story clothing and merchandise. This tee celebrates Ralphie's dad's reaction upon receiving the Christmas Story leg lamp. Before he opens the wooden crate that contains the leg lamp, he attempts to make sense of the word printed on the outside of the crate. He sounds out each syllable, "FRA-GI-LE." Confused, he remarks, "It must be Italian." The front of this shirt displays the fragile warning along with the leg lamp. Wear it as you repeat the Old Man's quote, "It's a major award!" It is available in both men's and women's sizes. In addition to the FRAGILE Leg Lamp tee above, browse the Christmas Story Clothing Gallery for more apparel like men's and women's clothes, kids shirts or hoodies.